Welcome to Handmade Monday. Pull up a chair, make yourself comfy and join in - you'll find more information about Handmade Monday here. 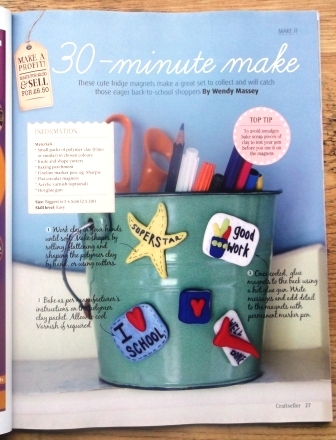 I had a couple of articles in this month's Craftseller magazine which hit the shops in the UK this week. This issue has a back-to-school theme... although I think this fabric-covered lunch box might be nice for summer picnics too! I don't know if you can tell, but this lunchbox has a cute monster on the front - they've called it Monster Munch! And I made some polymer clay fridge magnets with a "well done at school" kind of theme to them for their 30-minute-make slot. 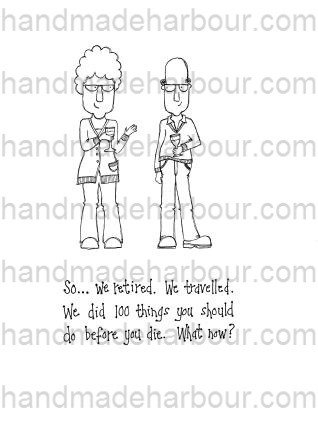 I also managed to scan and upload some of the first humorous digi stamps I've made. I'd really like to develop a range of these! But for now, you can see the first ones on the newly-created humorous digi stamps page. And I have to make a start on another project for Craftseller this week. I'm using sponges, paint and a nice linen fabric. And the theme is... (are you sure you're ready for this?) Christmas trees! And on that note - what have you been doing or making this week? I saw the magnets in craftseller, they look wonderful. This will be something my goddaughter will love to do. The humourous stamps look great. I love this image it made me think of my aunt and uncle. Have a great week. The fridge magnets are a great idea. I'm looking forward to see your Christmas stuff too. Lovely items this week Wendy. Love the lunch box cover - a great idea for boring plastic boxes. But, is it removable? What about washing the box in a dishwasher? Just love the badges, they are super funky and kids will love them! Christmas trees - nothing strange, I'm already making my own Christmas cards! :) Im looking forward to you revealing this project. It's amazing how many people are working on Christmas stuff! Martha, no it's hand wash only, I'm afraid! I couldn't figure a way to get what they wanted (fabric or paper piecing) *and* have it dishwasher-proof. 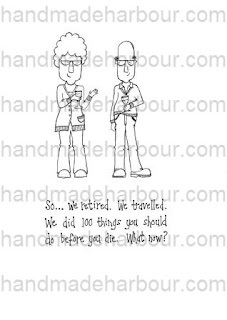 Really love the humerous digi stamps, especially the cake one. 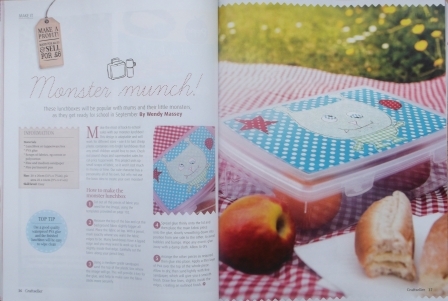 Can't wait to go and get the new issue of Craftseller too, your lunchbox looks great. I think I am going to have to subscribe to Craftseller, as I find it very hard to find in any newsagents, and loved the one copy I have managed to get my hands on. This is my first time posting on your blog so hi! I've never read craftseller either. Might have to get my hands on a copy. I'd love to see how you made up that lunch box. What a fab idea. I am soooo bored with plain tupperware! Oh, yes, I have seen the monster lunch box! As for mentioning the C world - I'm already planning for Spring 2014 - mad or what! Yes! Again some great articles and ideas how do you come up with it all? I agree comment mods are a pain, sometimes getting rid of the anonymous helps. This week my blog features where I sell my art. I hope you find the article interesting and that it may inspire you to start something similar in your area. 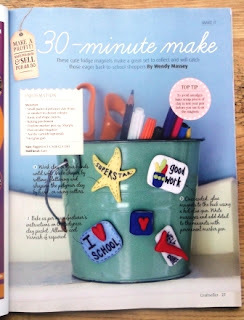 That's so lovely to see your work in Craft Seller magazine. I have just subscribe to see your work among other things. Thnak you for hosting this week. Best wishes. I love the fridge magnets - great Christmas stocking gifts. Hope you have a good week. Well Christmas will be in the shops very soon. Hello everyone sorry I've not been here in ages but I'm back now and ready to get involved in Handmade Monday again. I see there has been lots going on so I'm off to explore. I Noticed your make in Craft Seller - well done! Gotta go - work.